I’m finally back from a few weeks off blogging. I had shoulder surgery last Friday. This morning I saw the doctor who gave me the all clear to start working again. So I started blogging again too. I recently had a customer at a quilt show ask me about the hand dyed fabrics in my fabric kits that I make for my patterns. While it all seems so clear to me, it made me realize that not everyone is so aware of the advantages to having so many colors on one piece of fabric. All the fabrics I sell have at least 4 and up to 14 colors on one yard of fabric. It gives the fabric a “water-color” effect and makes it so much more interesting to use these fabrics for depth and design. Let’s take a look at my Rainbow multi-stripe fabric. This piece of fabric has 14 different colors on a one yard piece of fabric. It allows me SO many opportunities for variety in my projects, especially if you are doing applique whether it be contemporary or traditional. I want to share with you three different patterns that use the Rainbow stripe fabric for the majority of the project and how efficient it is to use this kind of fabric in a project. Let’s start with two of my OLDEST patterns, Petite Trilliums and Petite Dandelions. I call these patterns Petite because each of them has a larger version quilt. Petite Trilliums is one of my all time favorite quilts. Trilliums are some of the first “flowers” that appear in the spring and they make me happy because they herald spring after a long and tedious winter. 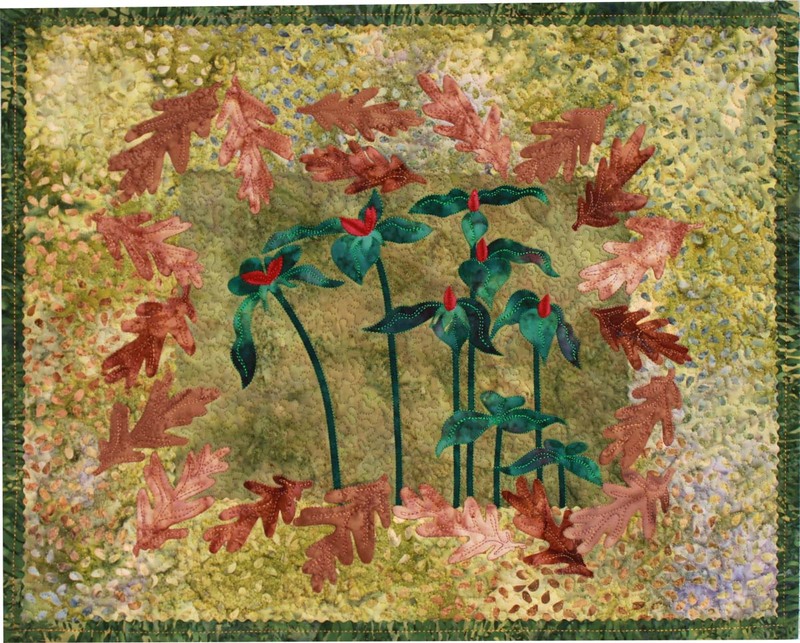 The original quilt Trilliums is 30″ x 40″ . When I made the pattern I wanted to use the wonderful versatility of my Rainbow stripe fabric. 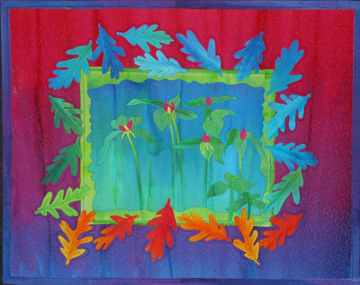 The background behind the trillium flowers is cut out of the middle of the rainbow stripe fab ric utilizing the blue/turqouise and aqua area of the fabric. I used the end of the rainbow stripe fabric, two shades of green, to create the two tone effect of the stems and leaves. 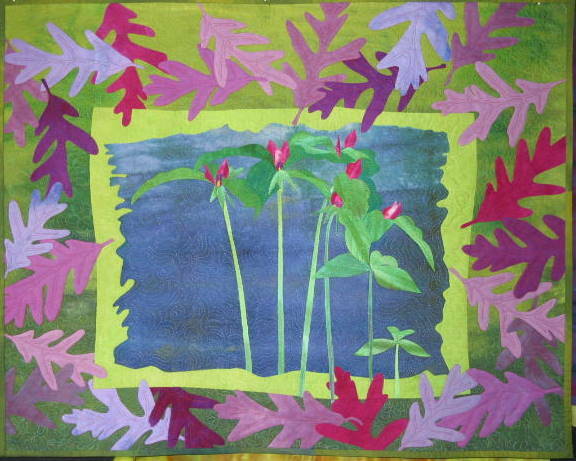 I used a little tiny bit of the fuchsia area to make the trillium flowers and set the background area against the lime green at the end of the fabric. I then placed the whole center section on top of the purple/magenta/fuchsia/red section of the fabric. Because I used the lime green between to background and the border it gives the composition definition. Finally I used all the colors in the rainbow fabric to cut out the oak leaves that surround the center composition, trying to place contrasting colors against each other. Using all the colors in the rainbow makes for a vibrant and fun wall quilt. I have made this pattern with other more traditional fabrics and it looks very different BUT I like the rainbow version best. I’ll talk about Petite Dandelion next time. I hope you enjoy using your hand dyed fabrics and don’t just save them for a future project. Remember, I’ll always dye more.